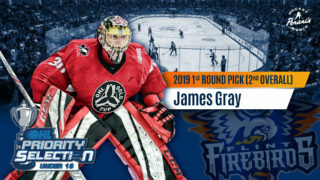 Flint, Mich. – The Flint Firebirds announced today that forward Jacob Winterton has committed to an Ontario Hockey League (OHL) standard player agreement and education package with the club. Winterton, a native of Brooklin, Ont., led the prominent 23-team Midget Ontario Minor Hockey Association (OMHA) with 33 goals scored during the 2017-18 regular season. In total, he recorded 52 points (33G, 19A) in 33 games with the Ajax/Pickering Raiders Midget AAA Hockey Club. He also played a key role in helping the Raiders capture the Gold Medal in the 2018 OMHA playoffs, notching eight points (5G, 3A) in seven post-season games. Jacob was also named the Eastern AAA Hockey League (ETAHL) OMHA All Star Game MVP. 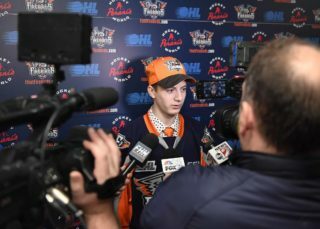 Winterton was selected by the Firebirds in the 10th-round (189th overall) of the 2017 OHL Priority Selection after garnering 33 points (13G, 20A) in 33 games played with the Ajax/Pickering Raiders Minor Midget AAA Hockey Club during the 2016-17 season. In four games at the 2017 OHL Cup, Winterton averaged a point-per-game, tallying one goal and three assists. Additionally, Jacob led Team OMHA White in points at the 2017 OHL Gold Cup, scoring two goals and adding two assists in five games. He also played in two contests with the Pickering Panthers of the Ontario Junior Hockey League (OJHL) during the 2017-18 season. The Firebirds’ training camp will take place Monday, Aug. 27 through Wednesday, Aug. 29. The camp will be held at the Firebirds’ official practice facility, Iceland Arenas, and is open to the public with free admission for all on-ice sessions. 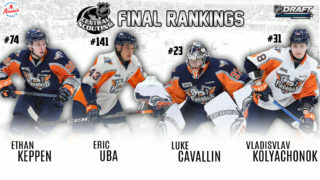 Stay tuned to www.FlintFirebirds.com for more information on the upcoming NHL Draft and Training Camp.